Heat oven to 350°. 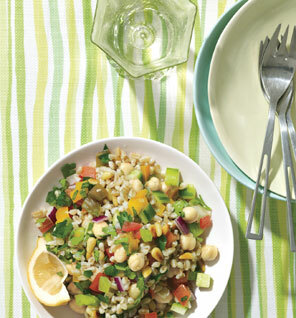 Cook couscous as directed on package; let cool and set aside. Toast pine nuts on a baking sheet in oven until slightly browned, about 6 minutes. Combine tomatoes and cucumber in medium bowl. Add garlic and onion. Add cooled couscous, chickpeas, oil, lemon juice, parsley and jalapeño; stir to combine. Season with salt and pepper and stir again. Marinate at room temperature about 20 minutes before serving. Do it with these chicken kabobs.